This is just ONE of the reasons why YOU should be a member of the ARRL. There is no other organization in the United States which lobbies the FCC, Congress, and the Executive Branch on behalf of all Amateurs. In addition, as noted in the example below, the ARRL is an active and important member of the International Amateur Radio governing bodies. They work for you. I’ll say it again, You should be a member of the American Radio Relay League! The Administrative Council (AC) of the International Amateur Radio Union (IARU) believes high-power wireless power transfer (WPT) for electric vehicles has significant potential for interference with radio communication. That assessment came as the AC met on September 15 and 16 in Landshut, Germany, immediately prior to the IARU Region 1 Conference, to review its priorities and positions with regard to the 2019 World Radiocommunication Conference (WRC-19). Conference Agenda Item 9.1.6 would call for studies in advance of WRC-23 to assess the impact of WPT for electric vehicles on radiocommunication services and to study suitable harmonized frequency ranges to minimize its impact. The AC determined that addressing the threat requires an increased commitment of resources by potentially affected radiocommunication services, including Amateur Radio. The WPT issue came up earlier this month at the meeting of CEPT WRC Project Team D, held in Vilnius, Lithuania, the week of September 11. At that gathering, IARU addressed the impact of spurious emissions from proposed high-power WPT systems for electric vehicles. IARU has expressed concern that current spurious emissions limits are not fit for this purpose in residential environments, and the potential impact on both Amateur Radio and broadcast reception is severe. As the ITU explained in its August 2016 report, “Applications of wireless power transmission via radio frequency beam,” WPT technology is considered a game-changer. “We will be able to become free from lacking electric power when electric power will be supplied wirelessly,” the report said. WPT vehicle applications typically use frequencies in the LF and MF range. Caribbean Island residents and the Amateur Radio community hardly had a chance to catch a breath from Hurricane Irma, as recovery operations continue, before Hurricane Maria was knocking on the door. The Hurricane Watch Net (HWN) activated September 18 on 14.325 MHz and on 7.268 MHz (after dark). 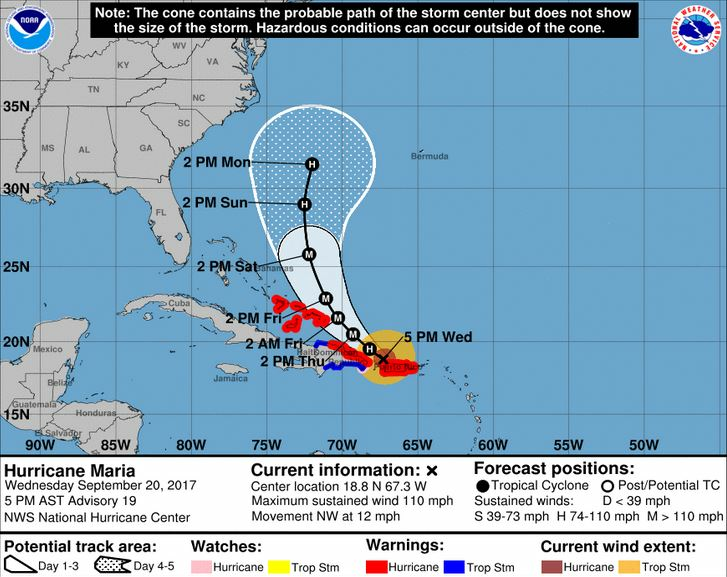 The VoIP Hurricane Net activated the same day to track Hurricane Maria and its potential impact in the Caribbean. 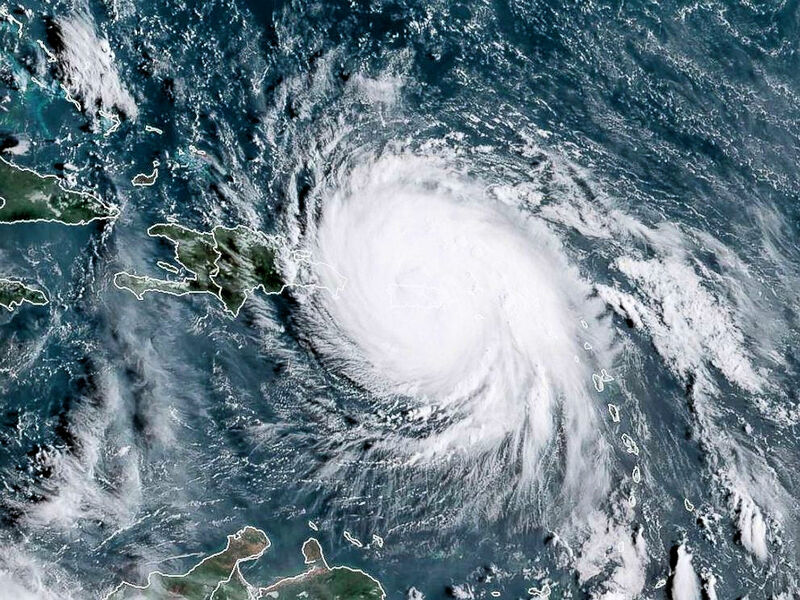 WX4NHC, the Amateur Radio Station at the National Hurricane Center, activated to receive weather information from both nets, while the Caribbean Emergency Weather Net (CEWN) was called up on September 18 on 3.815 MHz (and/or 7.188 and 7.182 MHz as propagation dictates) to provide round-the-clock coverage during the passage of Hurricane Maria and in the storm’s immediate wake. It has been handling health-and-welfare traffic in and out of Dominica and is accepting inquiries via e-mail. (Indicate your name and location, as well as that of the party sought). The Federal Emergency Management Agency (FEMA) opened 60-meter interoperability nets on September 19, using Channel 1, 5.330.5 MHz (primary voice traffic) and Channel 2, 5.346.5 MHz (digital traffic). These will remain active until the storm has passed and the need for these nets no longer exists. Maxim Memorial Station W1AW at ARRL Headquarters resumed its normal schedule of transmissions on Thursday morning, although the station has not yet been reopened to visitors. W1AW will continue monitoring active nets and 60-meter interoperability channels as needed. The station was helping to support the communication response to Hurricane Maria, monitoring the HWN, SATERN, the VoIP Hurricane Net, and the Caribbean Emergency Weather Net (CEWN), as well as checking Winlink2000 e-mail and providing interoperability support by keeping various frequencies open for hurricane traffic. The station was staffed around the clock during the communication emergency. The Hurricane Watch Net, the VoIP Hurricane Net, and WX4NHC stood down on September 20. The HWN was active for about 60 hours. This week’s bulletin was made possible with information provided by WB0TEV, QRZ DX, the OPDX Bulletin, 425 DX News, The Daily DX, DXNL, Contest Corral from QST and the ARRL Contest Calendar and WA7BNM web sites. Thanks to all. Dean, 8P6SH plans to be QRV as 8P50B on 20 meters in the CQ World Wide DX RTTY contest. QSL via KU9C. Gerhard, OE3GEA is QRV as 9N7GE. Activity of late has been on 30 and 17 meters using CW. His length of stay is unknown. QSL to home call. A group of operators will be QRV as BV2A/3 from SaXi, Tao Yuan City in the CQ World Wide DX RTTY contest. QSL via operators’ instructions. Operators Paul, R2AD, Elena, RC5A, and Yuri, RM0F are QRV as A25SP, A25BE, and A25BI, respectively, from Chobe National Park until September 25. Activity is on 160 to 10 meters using CW and SSB. QSL to home calls. Hal, JR4OZR will be QRV as A35W from Tongatapu Island, IOTA OC-049, in the CQ World Wide DX RTTY contest. QSL direct to JJ2VLY. Members of the Royal Omani Amateur Radio Society will be QRV as A44A in the CQ World Wide DX RTTY contest as a Multi/2 entry. QSL via A47RS. Jorge, EA9LZ will be QRV as EF9R in the CQ World Wide DX RTTY contest. QSL via EA5KB. Alain, F8FUA is QRV as FR/F8FUA until September 30. Activity is holiday style on the HF bands using CW, SSB and various digital modes. QSL to home call. Kazu, M0CFW will be QRV as MJ5Z in the CQ World Wide DX RTTY contest on all bands. Before and after the contest he is active as MJ0CFW. QSL to home call. A group of operators are QRV as MU/ON4ANN until September 24. Activity is on 160, 80, 40 and 30 meters using CW, SSB and various digital modes. QSL via M0URX. Special event station HL50NWPF is QRV until September 24 to celebrate the 5th Nakdong River World Peace Culture Festival. QSL via HL5FXP. Take, JA1UII is QRV as JD1BON until September 30. Activity is on 80 to 6 meters using CW, SSB and RTTY. This includes being an entry in the CQ World Wide DX RTTY contest. QSL to home call. Air activity. Activity will be on 80, 40, 20 and 15 meters. QSL via OE6SWG. will be on various HF bands using CW, SSB, RTTY, PSK31 and FT8. QSL both calls for this activity direct to home calls. Leo, PP1CZ is QRV as PY0F/PP1CZ until September 27. Activity is on 160 to 10 meters using mainly CW, with some RTTY, JT65 and FT8 as well. QSL direct to home call. Joerg, DM1OS will be QRV as SV9/DM1OS from Gavdos Island, IOTA EU-187, from September 23 to 25. Activity will be holiday style on the HF bands. QSL to home call. Katsumi, JA3KIO is QRV as T88XA from Koror Island, IOTA OC-009, until September 26. Activity is on 160 to 10 meters using CW, SSB, RTTY and JT65. This includes being an entry in the CQ World Wide DX RTTY contest. QSL to home call. In addition, Toshi, JA3JND is QRV as T88ON from Koror Island until September 28. Activity is on 40 to 10 meters using CW, SSB, RTTY and JT65. QSL to home call. Victor, WB0TEV is QRV as V31VP from Blackman Eddy until September 25. Activity is on 80 to 10 meters using some SSB. This includes being an entry in the CQ World Wide DX RTTY contest. QSL to home call. Champ, E21EIC is QRV as XW1IC from Vientiane until September 25. Activity is on 80 to 6 meters. This includes being a Single Op/Single Band on 20 meter entry in the CQ World Wide DX RTTY contest. QSL to home call. A group of operators will be QRV as ZF1A in the CQ World Wide DX RTTY contest. QSL via operators’ instructions. Robert, M0TTT will be QRV as ZB2TT in the CQ World Wide DX RTTY contest as a Single Op/All Band/Low Power entry. QSL via M0URX. The CQ Worldwide DX RTTY Contest, NCCC RTTY Sprint, Railways on the Air, NCCC Sprint CW Ladder, Maine QSO Party, Texas QSO Party and the AGCW VHF/UHF Contest are all on tap for this upcoming weekend. The 220 MHz Fall Sprint is scheduled for September 22. The CWops Mini-CWT CW Test, UKEICC 80-Meter CW Contest, Phone Fray and SKCC CW Sprint are scheduled for September 27. September 22, 2017 in Weekly Newsletters.